We are a well established Namibian enterprise with a passion for hiking and trekking. We started with hiking and wilderness tours in Namibia in 1991 and since then we have been the agent for one of Germany's leading outdoor tour operators, Hauser Exkursionen in Munich. The owners Kerstin Klein and Thomas Soutschka are passionate hikers with a lot of hiking experience in Africa, South America and Asia. Both have travelled Southern Africa extensively and have guided innumerable tours themselves. This extensive experience enables them to combine an in-depth knowledge of Southern Africa with the professionalism needed for organizing unforgettable tours. Hiking and wilderness tours offer a unique nature experience as they bring you into direct contact with the world you want to explore. This direct contact is part of our philosophy. No matter if you go on a hiking tour or on a self drive safari, we want to offer you the opportunity to change perspective and discover Namibia's miraculous landscapes on your own feet. Discover spots where no vehicle can go to. As close as you can. Thorough planning, experience and knowledge are essential for hiking trips to remote areas. We offer just that. We only employ qualified and experienced multilingual tour guides who have shown their professionalism and their ability to guide you safely also in difficult terrain. 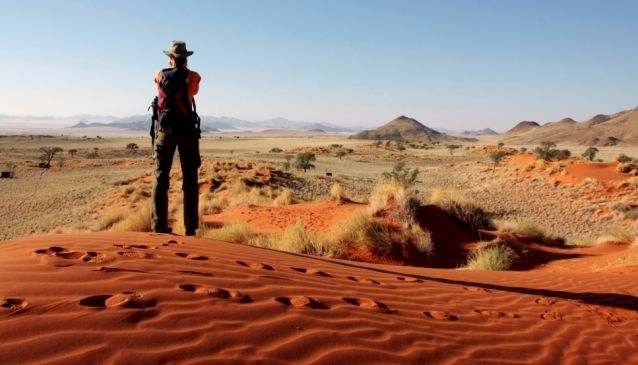 In Namibia's rugged and untamed landscapes they will keep you on track. In a small group of maximum 8 hikers you will be able to savour Namibia's vast and inspiring calmness. Namibia still offers landscapes where you are virtually alone. No beaten tracks. No masses of people. Our nature guides will be there to share their knowledge with you. Hiking brings you close to nature and our guides will round up your experience with information and the little stories and anecdotes that you won't easily find in a book.